The user friendly experience gets friendlier! Organization is key to any business. It is important to be able to easily access your information such as reports. When working with approval processes keeping copies of these in an organized fashion is large part in business success and ultimately business agility. It is very easy to lose a copy whether it is a hard copy or an online form. When using frevvo for your approval processes we make it easy for you to keep track and access all of your submissions. Submissions UI (User Interface) has a wonderful feature of being able to view all of your submissions. You’re able to view the submission with the filters that best suit your need. For example the options include, but are not limited to, date, names, date range, and more. 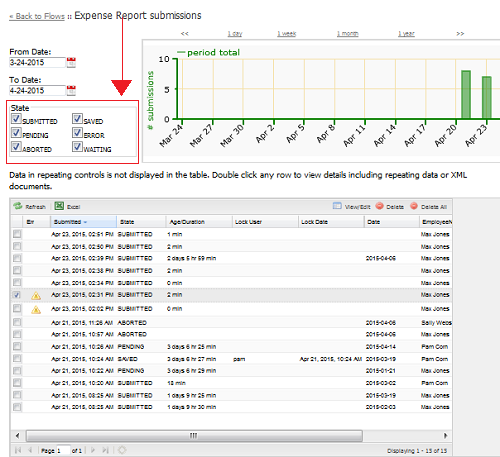 You can even view pending workflows to keep track of where they are in the process of completion. The user friendly experience gets friendlier! As seen below, there is an easy to use check box to not only save you time, but make it easier for you to filter out what you do and do not need for a specific search. You can view an easy user friendly step by step instructional process on everything discussed here on our docs page. Another business problem solved. We live by business agility and you should too. Let frevvo make your everyday tasks simpler. Sign up for a free 30 day trial now.